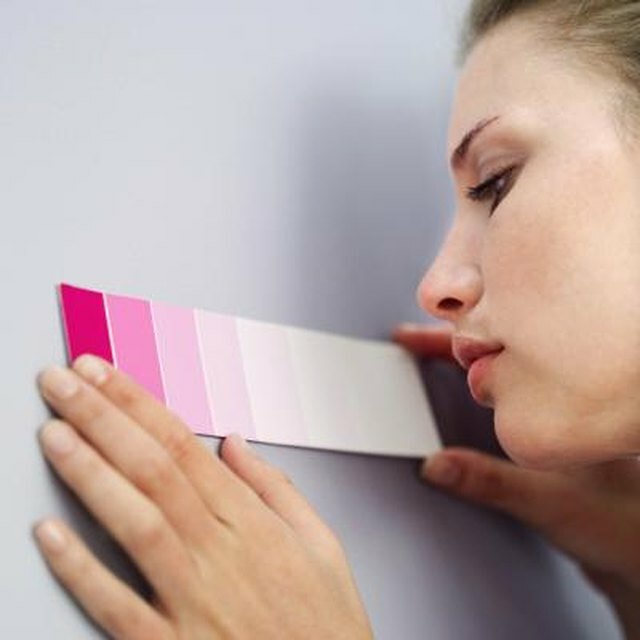 Hot climates in which temperatures may soar to over 100 degrees, or in which the air is thick with humidity much of the year, require careful choices in interior colors. If you live in a hot climate, choose interior colors that bring a sense of coolness as well as colors that brighten your home without adding more heat. Sea green is a cooling color for interiors in warm climates. The landscape may include shade trees that effectively filter the sunlight entering your home. While this reduces the interior temperature, it may also make your rooms look gray and washed out due to a lack of natural light. Lighting lamps all day adds to the sense of gloom. Use shimmering tones to brighten the interior without adding heat. Sea green or ocean blue are both cooling colors that add sheen to walls and a sense of smooth texture to fabrics. These colors attract light without bouncing it around the room, creating a more open, lightened feel in a shaded space. Creamy yellows and pale, sandy pinks convey a sense of cool in bright, sunny rooms but need accents of dark greens or reds to add visual depth. Pastel yellow walls tone down the flood of natural sunlight, but if pastel tones are used exclusively, details become lost in the "sameness" of the light in the space. Add mossy green by way of fabrics and artwork, and bring in flashes of red and sunny yellow with accessories such as pottery and [throw pillows](https://society6com/pillows?utm_source=SFGHG&utm_medium=referral&utm_campaign=4433). Rooms with exterior walls facing south may have high rates of heat gain as the wall collects the sun's heat and releases it into the interior. Cool down these rooms with fresh colors and smooth textures. Use a white paint color with a blue undertone to it for the walls, and paint the trim a mid-range blue tone. Add blue and white fabrics with smooth textures. Use artwork with darker tones of blue and green for visual interest. Add whitewashed hardwood floors or pastel blue carpet for texture and added coolness to the space. The architecture in hot climates sometimes employs great rooms and open spaces to encourage cross ventilation. These oversize spaces, though, may feel overly warm if the color scheme is too busy. A color scheme with more than three distinct colors is "energetic" and so generates a sense of heat. Use neutral earth tones for large rooms to provide a calming appeal. Alabaster walls and beige fabrics cool the room by tempering the light. Darker browns and gold accents in fabrics, window treatments and flooring add warmth without adding heat. The monochromatic color scheme is at once cozy and fresh.